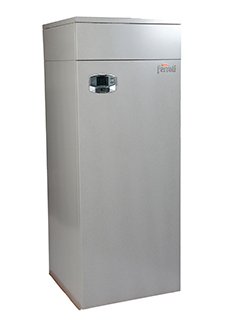 The Quadrifoglio B is a stainless steel condensing, high efficiency boiler for singular or modular installations. There are four models available with outputs ranging from 70Kw up to 320kW.The stainless steel heat exchanger in AISI 316 Ti consists of a vertical tube arrangement with low thermal load and huge water content permitting design of systems with a very high ΔT. This is patented by Ferroli and has been designed to enhance thermal exchange and improve flue gas condensation. The burner is premixed microflame providing low NOx Class 5 combustion. We offer a complete range of water, gas and flues accessories which are necessary for the installation of cascading 2 or 3 boilers, offering outputs from 13.7kW to 960kW.